Each year, the Northwest Arkansas Chapter celebrates National Philanthropy Day by honoring our local philanthropists and fundraising community at the National Philanthropy Day Awards Luncheon. This year’s luncheon, is Wednesday, November 13 at the Fayetteville Town Center in Fayetteville. We request nominations for individuals, businesses, and groups who have made Northwest Arkansas a better place to live and work through their dedication to philanthropy. An anonymous panel of community members selects Honorees to be recognized at the NPD luncheon. We invite you to submit nominations for the 2019 NPD awards online. Each nomination will include information requested for each category (500 words limit); additional recognition or awards your nominee has received (250 words limit) and a maximum of three letters of support uploaded in one document. Please note that the deadline for submissions is 5:00 p.m. Friday, May 21, 2019. If you have any questions regarding the nominating process, please contact Emily Rappe’ Fisher, 2019 NPD Co-Chair, at afpnwa@gmail.com or 479-236-3369. Please reference the Awards Criteria to determine which award category is best suited to your nominee. The following items are required for a nomination to be complete. Incomplete nominations will be discarded and not reviewed by the awards panel. Submit each nomination online by clicking on the category heading below. Respond to the information requested for each category – 500 word limit. Include any additional recognition or awards your nominee has received – 250 word limit. Include letters of support for each nominee (maximum of three) – upload in one file. If your nominee is selected, we will request your assistance in obtaining photographs and biographical information for publicity purposes. We will give you the opportunity to notify your nominee of a selected nomination. You will be expected to host your selected NPD Award nominee at the awards luncheon on Wednesday, November 13, 2019 at the Fayetteville Town Center in Fayetteville. Online Nominations must be received by 5:00 p.m. Friday, May 21, 2019. A maximum of three letters of support may be attached in one file. If you have any questions about the nomination process, please contact Emily Rappe’ Fisher at afpnwa@gmail.com or 479-236-3369. The following awards are presented each year at the National Philanthropy Day luncheon. Please note that not every award is given each year. Awards are contingent upon eligible nominations. The Outstanding Volunteer Fundraiser Award is presented to individuals who demonstrate exceptional leadership in fundraising, devote significant time and effort to their charitable cause, and show a deep commitment to the advancement of the organization's mission. Recipients of this award are volunteers who make substantial contributions of time, effort, ability, and leadership to successful fundraising projects and/or successful projects to develop in-kind donations and donations of volunteer time and effort. The Outstanding Fundraising Executive Award is presented to individuals who demonstrate exceptional leadership and expertise as professional fundraisers. 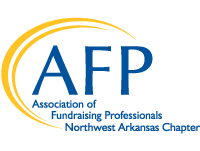 Nominees should have at least five years of professional fundraising experience, demonstrate a commitment to both the community and professional field of fundraising and development, and be a member of the Northwest Arkansas Chapter of the Association of Fundraising Professionals. The Outstanding Philanthropic Organization is presented to organizations that demonstrate exceptional commitment to the nonprofit community through financial support and through encouraging and motivating others to take leadership roles in philanthropy and community involvement. The Ernie Lawrence Outstanding Professional Advisor is presented to individuals who demonstrate exceptional commitment to the nonprofit community by encouraging charitable giving among their clients and who are recognized as leaders in promoting civic and professional involvement. The Outstanding Foundation Award is presented to foundations that demonstrate exemplary commitment to the nonprofit community through financial support and through encouraging and motivating others to take leadership roles in philanthropy and community involvement. The Outstanding Corporation Award is presented to companies that demonstrate exemplary commitment to the nonprofit community through financial support and/or through encouraging and motivating others to take leadership roles in philanthropy and community involvement. The Legacy Award recognizes exemplary philanthropy contributions made in legacy form via bequest, trust, or other planned gift. If the award recipient is deceased, members of the recipient’s family will be invited to accept the award. The Lifetime Achievement Award is presented to individuals, families, or organizations that demonstrate a lifetime record of exceptional generosity, which, by their direct financial support, have encouraged others to assume civic or charitable responsibility. The Youth in Philanthropy Award is presented to individuals, schools, civic groups, or other youth organizations that demonstrate outstanding commitment to their community through direct financial support, development of charitable programs, volunteering and/or leadership to improve the community in which they live. There is an award for an individual up to age 23, or an award for a group up to age 23.